PlayStation Minis are little iPhone games, except no one talks about them (and they're playable on a PlayStation Portable, not an iPhone). Sorry, but I've got to change that. According to the official PlayStation blog (in Europe, sigh), Pac-Man Championship Edition — possibly the best Pac-Man game ever made — and Mobigame's Edge — a nifty game that I find hard to control on the iPhone — are both available on the European PlayStation store now, for download and play on a PSP and PlayStation 3. 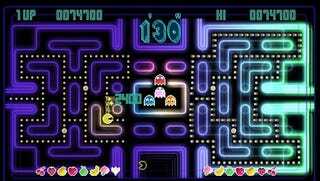 The PlayStation blog mentions Pac-Man CE's six modes, time limits, and unique mazes but doesn't specify if any of those features are PSP-specific or just the same as what was in the Xbox Live Arcade original. Who cares? It's Pac-Man CE on the go. And it's Edge with a control stick. Please don't be confused, Pac-Man fans. The Mini is the original Pac-Man Championship Edition, not the spiffy new Pac-Man Championship Edition DX. Both are stylish, speedy riffs on Pac-Man. Both are wonderful. We're checking with Sony to see if/when these Minis are scheduled for North American gamers.